William Landphier was the son of James Landphier and Anna Anderson. William Landphier died after 1954. Jesse Landphier was the son of James Landphier and Anna Anderson. Jesse Landphier died after 1954. Harley Heffron married Ethel Rouse, daughter of Charles Dixon Rouse and Elizabeth Marie Holmes. Henry Louis married Katherine M. Honer, daughter of John Joseph Honer and Anna C. Schauf. Henry Louis died after 1972. Bernard Louis was the son of Henry Louis and Katherine M. Honer. Bernard Louis died after 1972. Victor Louis was the son of Henry Louis and Katherine M. Honer. Victor Louis died after 1972. Ira Louis was the son of Henry Louis and Katherine M. Honer. Ira Louis died after 1972. Charles Louis was the son of Henry Louis and Katherine M. Honer. Charles Louis died after 1972. Madalene Louis was the daughter of Henry Louis and Katherine M. Honer. 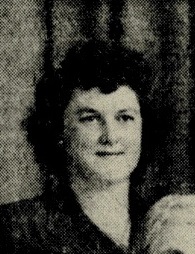 Madalene Louis died after 1972. Married Name Her married name was (?) Witkowski. (?) Louis was the daughter of Henry Louis and Katherine M. Honer. (?) Louis married Leo Witkowski. (?) Louis died after 1972. Leo Witkowski married (?) Louis, daughter of Henry Louis and Katherine M. Honer. Leo Witkowski died after 1972. Alphonse John Frank was born on 23 December 1888 at Spring Green, Sauk, Wisconsin. He married Magdelene C. Honer, daughter of John Joseph Honer and Anna C. Schauf, circa 1926. Alphonse John Frank witnessed the death of Eugene J. Weitzel in July 1937 at car accident, Wisconsin; Car crash kills 2 (Eugene Weitzel and William Meise) and 4 hurt (William Ring, Alfonse Frank, Albert Weidner and Alois Hetzel). Alphonse John Frank died on 3 May 1983 at age 94. Frieda Hahn was the daughter of Theodore H. Hahn and Hannah (?). As of 1979, Frieda Hahn was never married. Evelyn Hahn was the daughter of Theodore H. Hahn and Hannah (?). As of 1979, Evelyn Hahn was never married. Married Name 3 September 1935 As of 3 September 1935,her married name was Haas. Myrtle Jacobson married John A. Haas, son of John J. Haas and Franziska Gruber, on 3 September 1935. Myrtle Jacobson died in 1995. 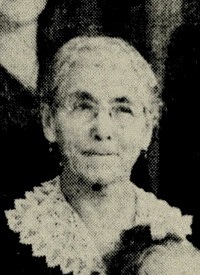 Patricia Haas was the daughter of John A. Haas and Myrtle Jacobson. Married Name before 1943 As of before 1943,her married name was Reuter. Eleanor Marie Sigrist was born on 11 October 1921 at Richland, Wisconsin. She was the daughter of Guy Edmund Sigrist and Ruby Leona Holloway. Eleanor Marie Sigrist married Reginald Donald Reuter, son of John H. Reuter and Hulda (? ), before 1943. Eleanor Marie Sigrist died on 23 November 2004 at Richland, Wisconsin, at age 83. In November 1944 4 generations photo including Mrs Eugene Sigrist (Cora Merrill), son Guy Sigrist, granddaughter Mrs Reginald Reuter (Eleanor Marie Sigrist), and great-granddaughter Charlotte Marie Reuter. Guy Edmund Sigrist was born on 9 July 1893 at Richland, Wisconsin. He was the son of Eugene Sigrist and Cora May Merrill. Guy Edmund Sigrist married Ruby Leona Holloway circa 1915. Guy Edmund Sigrist died on 20 April 1982 at age 88. Married Name 17 February 1887 As of 17 February 1887,her married name was Sigrist. Cora May Merrill was born in March 1877 at Richland, Wisconsin. She married Eugene Sigrist on 17 February 1887 at Richland, Wisconsin, by Rev. John Walworth. Cora May Merrill died after 1944. Eugene Sigrist was born in June 1854 at Wisconsin. He married Cora May Merrill on 17 February 1887 at Richland, Wisconsin, by Rev. John Walworth. Eugene Sigrist died in 1943. Married Name circa 1915 As of circa 1915,her married name was Sigrist. Ruby Leona Holloway was born on 13 April 1895 at Wisconsin. She married Guy Edmund Sigrist, son of Eugene Sigrist and Cora May Merrill, circa 1915. Ruby Leona Holloway died on 20 September 1958 at age 63. Married Name 13 June 1942 As of 13 June 1942,her married name was Lins. Loretta M. Witzko married Dr. L. Joseph Lins, son of Leo Joseph Lins and Eva Magdalene Schwartz, on 13 June 1942. Loretta M. Witzko died on 17 November 1993. Anton Breunig married Anna Bronner. Anna Bronner married Anton Breunig. Anna Bronner was born in 1885. Married Name before 1975 As of before 1975,her married name was Brickl. Dorris (?) died before 1975. She married Norbert J. Brickl, son of Anton J. Brickl and Annie M. Lins, before 1975 at 1st marriage for him. Name Variation George Feldkamp was also known as Gerhard Wildkamp. George Feldkamp was born circa 1840 at Germany. He married Julia Schaffer on 2 November 1862 at Adams, Illinois. George Feldkamp died before 1873. [S247] U.S. Federal Census 1870 U.S. Federal Census, by Ancestry.com, Year: 1870; Census Place: Fall Creek, Adams, Illinois; Roll: M593_186; Page: 146A; Family History Library Film: 545685. Name Variation Julia Schaffer was also known as Schaeffer. Married Name 2 November 1862 As of 2 November 1862,her married name was Wildkamp. Married Name 2 November 1862 As of 2 November 1862,her married name was Feldkamp. Married Name 11 March 1873 As of 11 March 1873,her married name was Reese. Julia Schaffer was born circa 1846 at Germany. She married George Feldkamp on 2 November 1862 at Adams, Illinois. Julia Schaffer married Frederick W. Reese on 11 March 1873 at 2nd marriage for her, Adams, Illinois. Julia Schaffer died between 1910 and 1920. [S246] U.S. Federal Census 1880 U.S. Federal Census, by Ancestry.com, Year: 1880; Census Place: Kinderhook, Pike, Illinois; Roll: 242; Page: 509A; Enumeration District: 188. Name Variation Mina Feldkamp was also known as Reese surname of stepfather. Mina Feldkamp was born circa 1868 at Illinois. She was the daughter of George Feldkamp and Julia Schaffer. Name Variation Ida Feldkamp was also known as Reese surname of stepfather. Ida Feldkamp was born circa 1869 at Illinois. Name Variation Frederick W. Reese was also known as Fred W.
Frederick W. Reese was born on 2 September 1840 at Lippedetmold, Germany. He married Julia Schaffer on 11 March 1873 at 2nd marriage for her, Adams, Illinois. Frederick W. Reese died on 15 August 1927 at Quincy, Adams, Illinois, at age 86.